Conversion optimization is about driving more sales from the existing traffic on the websites or landing pages, by improving overall conversion rate and troubleshooting problem areas. 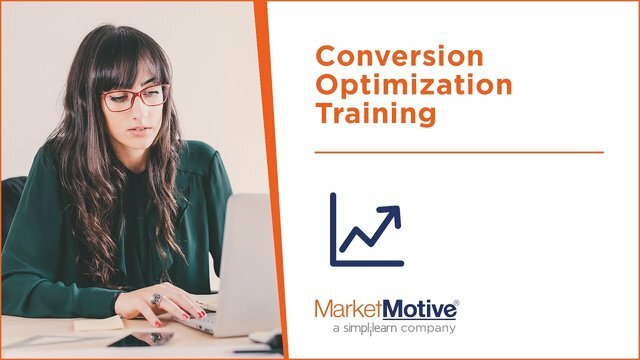 Market Motive’s conversion rate optimization course will take you through all the methods that will help to optimize the conversion funnel. The course covers the following topics in detail – conversion planning, conversion structure design, testing methods, product page optimization, PPC conversion strategies and conversion analytics. Upon completion of the course, you will become a complete expert on conversion optimization. Master the latest tools and techniques of conversion optimization. Ideate and implement a systematic framework to motivate overall conversions on the site. Impact the revenue of the business without increasing the marketing budget. The training can be attended by anyone who is keen on becoming competent in conversion optimization. This course will be greatly beneficial to conversion specialists, web analysts, digital marketers, business owners/entrepreneurs.